What is this beguiling sorcery? We’ll freely admit it, we fall into the camp that misses the Opeth sound of old. The death growls are gone….and we miss ’em! The black metal influences are gone….and we miss ’em! The untouchable likes of My Arms, Your Hearse, Blackwater Park and Ghost Reveries are likely never to be repeated, a style consigned to the history books as Opeth explore progressive rock ever further. However, those almighty albums are the past and Opeth have fashioned themselves a new future; settling into the ‘classic rock’ years as opposed to those decades spent under the watchful eye of the ‘metal hammer’ generation. Admittedly, this wholesale change has taken some getting used to. First we had the shock of Heritage – a brave move in anyone’s book but still a damn fine album – then came Pale Communion‘s heavily melodic, jazz-fusion-esque progression and now it’s time for Sorceress to beguile and beg new courtiers into the court of Opeth’s crimson kings. But, what to expect? More acoustic semi-folk tinkerings? A mind-bending journey into twisted psychedelic realms?Or, will the ‘metal’ return, refined but still defiantly metallic? 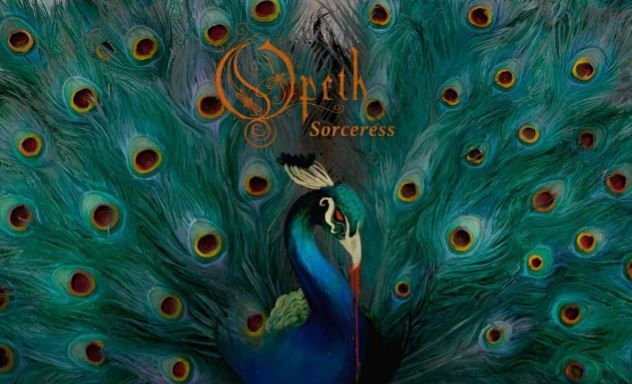 Interestingly, Sorceress embodies all those semi-cryptic descriptions (it’s not as if Opeth are easily pigeon-holed anyway) and is heavier than their two previous efforts. Perhaps not ‘heavy’ in the way you’d expect Opeth to be but the riffs are back, awash with Jon Lord-esque keyboards and a 70’s warmth. Like a meeting of minds between jazz-fusion improv kings The Mahavishnu Orchestra and proto-doomers Bang, the surprises keep coming and this is an album destined to go down as one of the finest of 2016 (if not the decade). As always, the playing here is exemplary, oozing atmosphere and a nostalgic smoulder that’s carried by Mikael Akerfeldt’s never-better vocals. The man has hit new heights here, exuding confidence and his multi-faceted style is pitched perfectly. In this instance, the question of ‘do we still miss the death growls’ becomes redundant as there’s nothing here to growl over. One thing is for sure, Opeth are no longer in thrall to Mikael’s encyclopaedic knowledge of prog’ heritage, they are now a fully paid-up prog juggernaut in their own right. A logical outcome of all that came before, Sorceress still casts its own spell and proves that sombre and upbeat can inhabit the same locale. A track-by-track review of Sorceress would be redundant. You have to absorb this bewitching beast in its entirety, wallow in its grandiosity, marvel at its intricacies and bow down before the modern prog kings. Three albums into their new direction and we’ve finally come to terms with the change. This is the sound of Opeth and it’s a wonderful thing.